... when they're in the shiny! new! thing! novelty phase. Decided I should throw in something for scale since my nattering about laceweight yarn is pretty meaningless to non-stitchers. Coin at top is a dime (ten cent piece), the smallest Canadian coin (same size as the American dime but ours, of course, has Elizabeth II on one side and the Bluenose on the other). For those of you not familiar with North American coinages, the dime is 1.8 cm in diameter. 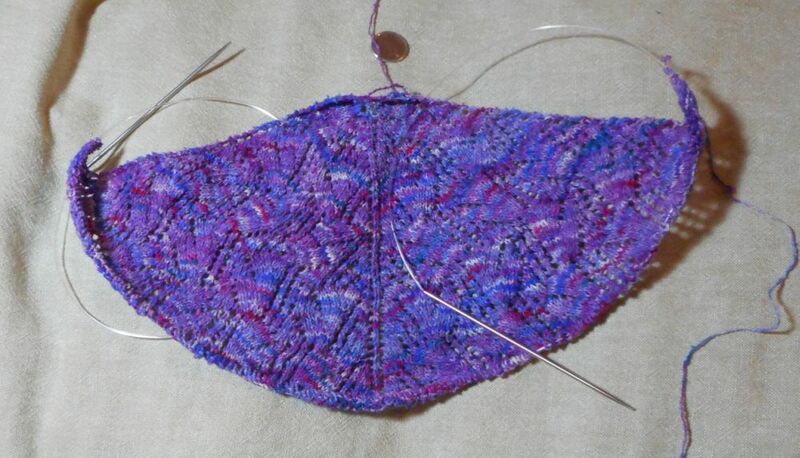 I'm using 2.25 mm needles, and I'd completed 80 rows of knitting. Short version: this is on a much smaller scale than anything I've done before. Starting to "feel" the lengthening of the rows now; four more stitches get added to the width every other row as part of the patterning (I started by casting on three stitches). P.S. Colours a little more intense as this was taken under a daylight bulb while the previous photo was natural light on an overcast day. Reality is somewhere between the two.